﻿﻿﻿﻿Elmer Kelton’s 1973 novel resonates during the current drought. ﻿Born in the spring of 1926 to a West Texas ranch foreman and his wife in a line shack called Horse Camp on the Five Wells Ranch in Andrews County, Elmer Kelton by all rights should have grown up to be a cowboy. But while his father, Buck Kelton, spent decades in the saddle working cattle, it soon became clear that the nearsighted youngster had not been stamped from the same leather. Young Elmer preferred reading books about the Old West, an era still within the memory of many people during his early years, to doing horseback chores on a ranch. After graduating from Crane High School in 1942, Kelton left West Texas for the cedar-covered hills of Central Texas to attend the University of Texas in Austin. As World War II progressed, he tried to enlist in the Navy, but it wouldn’t take him because he was flat-footed. His condition didn’t concern the Army, which drafted him in 1944. Back from the war, Kelton married Anni Lipp, an Austrian woman he had met while overseas. He resumed his coursework at UT, earning a journalism degree in 1948. Returning to West Texas, he got a job with the San Angelo Standard-Times as an agriculture reporter. During his off time, he started writing and selling Western short stories and then paperback Westerns. Not long into Kelton’s newspaper career, it stopped raining over West Texas and much of the rest of the state. The drought didn’t break until the spring of 1957. 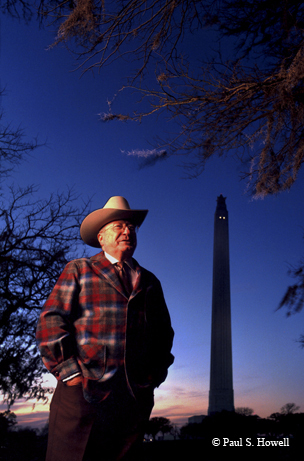 The protracted dry spell inspired a Texas classic, Kelton’s 1973 novel The Time It Never Rained. The novel’s central character is a tough, 50-ish rancher named Charlie Flagg, whose 15-section (“three deeded, the rest under lease”) spread is near the county seat of Rio Seco. As the drought worsens, Flagg, a moral but cantankerous man who does not believe in government agricultural assistance programs, struggles to save his ranch until it rains again. Beyond telling a good story, Kelton artfully portrays West Texas culture midway through the 20th century. Kelton refers to “thieves” in the sense that a good novel often borrows from real events, “liars” in the sense that writers of fiction make things up to tell the truth even more powerfully. Just as it can take years to recharge an aquifer, it took nearly two decades for Kelton to process what he saw during that drought into The Time It Never Rained. Despite Kelton’s growing national stature as a writer, he had to write three different versions of The Time It Never Rained before it finally appealed to an editor. 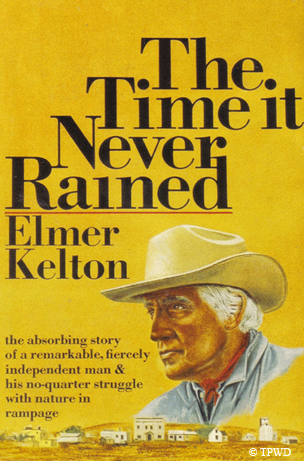 The Time It Never Rained proved Kelton was more than a writer of formulaic Westerns. The novel netted him a Spur Award from the Western Writers of America, one of seven such honors he would receive during his career. In addition, his writing won four Wranglers from the National Cowboy and Western Heritage Museum. Other honors piled up over the years. “I believe that The Time It Never Rained is one of the dozen or so best novels written by an American in this century,” critic Jon Tuska declared in The American West in Fiction. Assessing The Time It Never Rained along with Kelton’s other books in 1995, the WWA voted Kelton the greatest Western writer ever. That put him at the head of a herd including Zane Grey, Willa Cather and Louis L’Amour. “I wouldn’t want to defend that in a court of law,” he said in 2003, demonstrating a sense of humor as dry as a West Texas stock tank is these days. But he did tell friends he believed The Time It Never Rained was his best book. Cochran says The Time It Never Rained (he shortens the title to TTINR) has remained a steady seller. “It’s his best book, and in my opinion Elmer didn’t write a bad book,” he says. Now that another drought grips Texas — one that looks as if it could be worse than the 1950s dry spell — Cochran says a lot of his customers see the book in his store and comment about living through that time again. 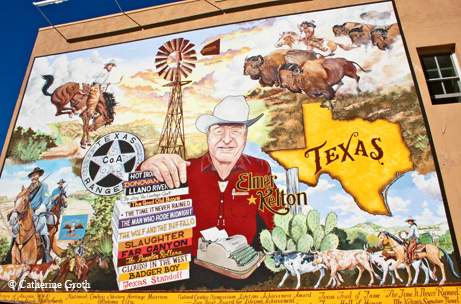 Kelton died in San Angelo on Aug. 22, 2009. When they buried him a few days later, most of the grass in Lawn­haven Memorial Gardens Cemetery lay as dead as those below it. Much of Texas had been in the midst of drought for more than a year. That Kelton died at a time when it wasn’t raining, in what turned out to have been a prelude to the current extraordinary drought, made his passing seem all the sadder, but with The Time It Never Rained he left Texas a novel that is a reminder of the power of human endurance and the truism that nothing lasts forever — not a great writer, and not a terrible drought.